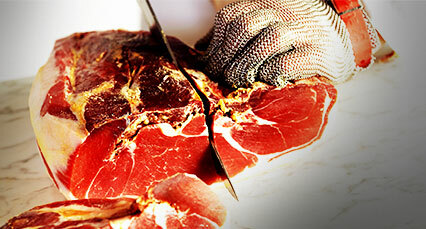 There are two methods for carving Serrano ham, with a knife or with a machine. Machine-carving is done primarily by professionals using boned pieces of Serrano ham, as it is not possible to cut whole hams or shoulders using this system. This process requires a precise technique and adequate de-boning of the piece in order to facilitate handling. Click here for how to cut Serrano ham with a knife. Traditional: Boned piece of Serrano ham without added manipulation, and as such should be conditioned before proceeding with machine carving. In order to achieve up to 95% profitability for the cut, the best method is to section the traditional format into three pieces. Bloc and half centre: Pieces of boned, polished, trimmed and pressed Serrano ham prepared for carving in a way that allows for a high yield. Ham carving or slicing machine. 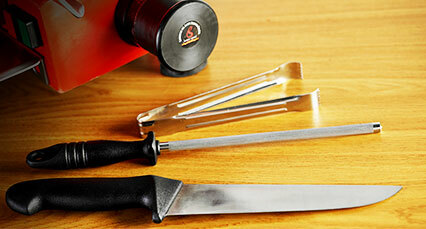 Paring knife: wide, rigid blade, used to remove the piece’s rind and outer layer of fat. Gloves: used to optimize safety and hygiene during handling. Tongs: to handle ham slices. Machine-carving is done primarily by professionals using boned pieces of Serrano ham, as it is not possible to cut whole hams or shoulders using this system. 1. 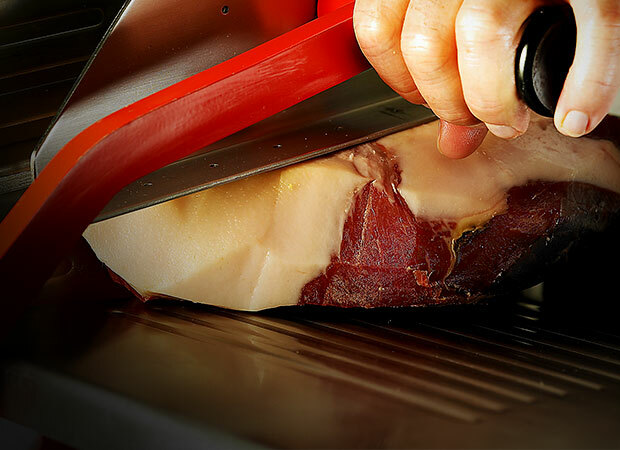 In order to carve a Serrano ham with a machine, it must be boned and prepared beforehand. When starting from the traditional format, the first step is to peel and clean it, removing the rind and fat covering the Serrano ham and dividing the piece into three chunks to optimize profitability. When starting with a bloc or half centre, the above steps are not necessary. 2. Once the parts are divided, place each of the boned pieces of Serrano ham on the ham carving machine prior to turning it on. 3. Using the dial on the machine, we can adjust the thickness we want for each slice, and by doing this, making sure we obtain thin slices. 4. 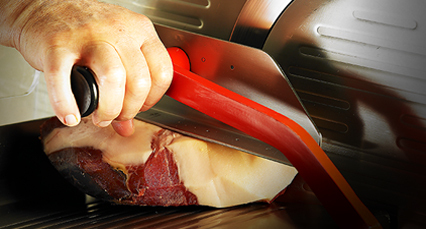 In order to begin carving the Serrano ham, turn on the machine and, using the handle, slide the piece towards the knife. 5. Finally, the product can be presented, avoiding overlap between slices. 1. For improved hygiene, the Serrano ham slices should be properly handled with the tongs or with hands covered by plastic gloves. 2. Before consumption and tasting, it is advisable to take the ham from the refrigerator approximately 10 minutes beforehand in order to consume it at the ambient temperature. 3.In the event that the piece of Serrano ham is not carved or consumed in its entirety, it is recommended to wrap it in paraffin paper or plastic wrap and keep it in the refrigerator at a refrigeration temperature (0-6ºC). After carving the ham, it is possible that you might find white spots (tyrosine), a while veil, or darkened or iridescent areas. More information in the After Carving section. 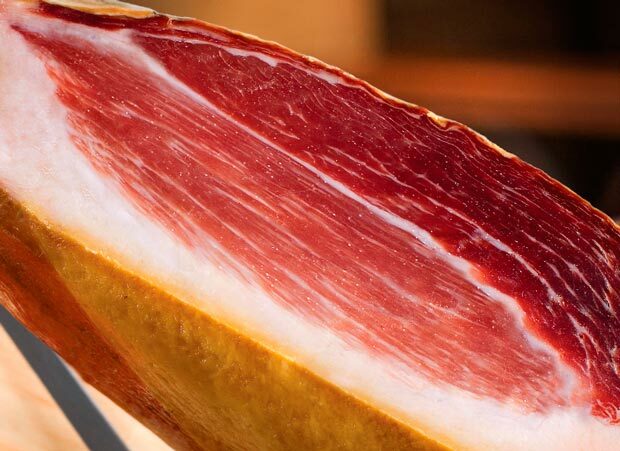 Traditional format: by correctly handling the piece and following the instructions recommended by the Consorcio del Jamón Serrano Español, high profitability can be obtained: 95% of the Serrano ham into attractive, pleasing slices and the other 5% can be used for culinary uses, either diced or cubed. Bloc and half centre formats: these pieces of Serrano ham permit 100% use in slices, or if you wish, cubes, as they have practically no rind or fat that must be eliminated.